Memorial Day is early this year, more or less. It’s always on the last Monday of May and that would be May 25. Here in Maine, Memorial Day is a beginning of many things, like tourism and gardening. The governor’s economic development team probably has an algorithm that appropriates state funds based on the inbound and outbound volume of traffic on the Maine Turnpike. I have my geraniums and tomato plants ready to go. But the holiday weekend is off to a rocky start. I made a grave mistake last night when I stopped by “Handyland” for dessert. Handy was watching an episode of Hoarders on his giant Tee Vee and I sat down to watch it with some apple pie à la mode. For those who might be new to this blog, I don’t have a Tee Vee. It’s a choice I made about 15 years ago and I try not to be “holier than thou” when I tell people about my lack. (But no thank you, I don’t want your old Tee Vee.) I’m out of touch with a lot of the lingo people use in every day conversation because television is such a large part of the American consciousness. Once upon a time, biblical and historical metaphors like “he’s older than Methuselah” or “Rome wasn’t built in a day” were part of the common parlance, but today, one might more likely hear references to characters and situations from Game of Thrones, Orange is the New Black, or The Walking Dead. It’s hard to keep up with it, but I do the best I can. Handy explained the “hoarding” phenomenon to me some time ago when we passed an “auction” sign at a storage facility. Again, it was hard to understand. It’s probably not that easy. 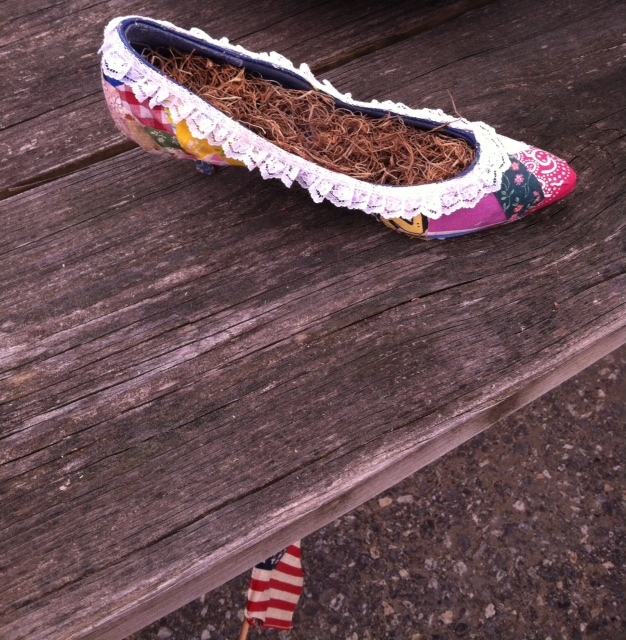 At one time, recycling an old shoe into a planter with fabric scraps, decoupage glue, and lace might have seemed like something to give a young Martha Stewart a run for her money. But the craft hadn’t stood the test of time. On a brighter note, it’s fifty days (more or less) until the Moxie Festival. I know, I can hardly believe it either. I’ve been working on some fun changes to the Recipe Contest, including a new judging format and a new location. Check in here on Tuesday (blog dark on Monday, due to Memorial Day observance) and I’ll tell you all about it. This entry was posted in Friday Pillow Talk and tagged Hoarders, I don't have a Tee Vee, Memorial Day. Bookmark the permalink. Stay away from the telly, and keep us up to date on Moxie Fest. This reader has been waiting for all the Moxie details..